Hi friends, I have been very busy making food for clients and spending quality time with my family. I apologize for not writing on here for a few days but I did keep up with everyone’s e-mails at least. Hope you all are having a beautiful summer! 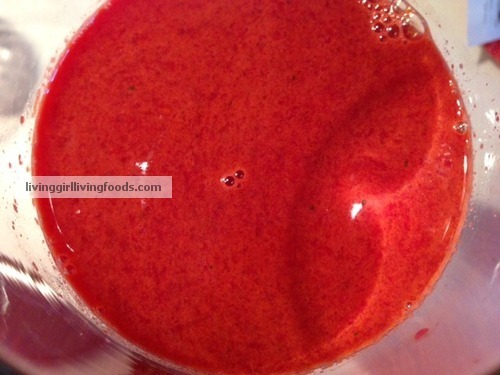 This is a sweet, savory and spicy drink that still maintains a beautiful color that doesn’t look murky. I found it to mostly taste like beet and pepper. Yellow Bell Pepper has a wonderful sweetness, the juice comes out a stunning bright yellow that I think helps make this drink look truly stunning. Peppers have a fair amount of water content and can be a surprisingly tasty additional to juices. Technically speaking they are a fruit so it makes sense that peppers can provide more. On to some more food adventures! I recently tried an Elephant Heart Pluot for the first time ever. The shape does look like a heart we would draw not so much the shape of an actual human heart though. I personally do not know what an elephant heart looks like but I figured I would share this photograph with all of you and may be we can share some thoughts. Pluots are a hybrid fruit, this does not mean they are genetically modified. Hybrid fruits are made by actual farmers while GMO foods are created by scientists. Pluots are 75% Plum and 25% Apricot. The skin on this pluot is yellow with bright green dots. Even though this fruit looks large and strong it does bruise rather easily. When choosing fruits I typically recommend cupping the fruit with your hand to test if it is ripe. Poking or squeezing isn’t great for the fruit and with all of the traveling it may have gone through certain spots are more likely to be far more delicate/squishy than other parts. It does not taste sweeter than the more traditional red plums, I found this one to not be as juicy either. The notes are more on a vanilla, honey, warming, and soft spectrum. I can see this stonefruit being wonderful for a tart or any type of dessert. I personally just washed it and chowed down :D! 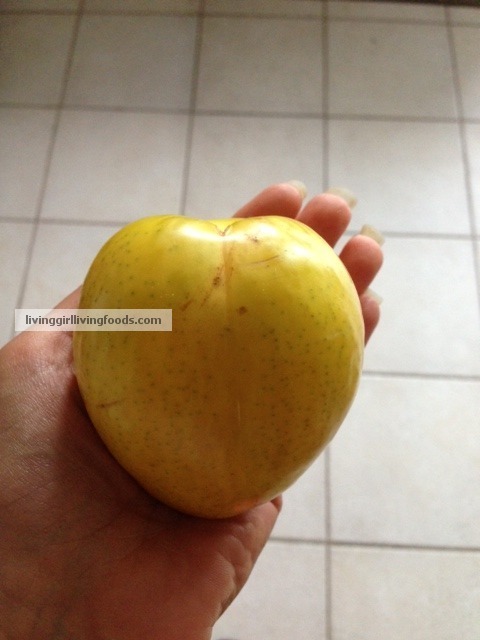 On my next post I have more fruit adventures to share, I am just waiting for the goodies to ripen. « Tahini Pineapple Shake Recipe <3 What Is Tahini? Living Tahini Brands?